Governor Samuel Ortom of Benue State on Monday said the call for the declaration of a state of emergency in Benue and one other state by the leadership of Miyetti Allah Kautal Hore is tantamount to punishing those states that have performed their legitimate constitutional responsibilities of enacting laws for good governance. The governor, in a statement issued by his media adviser, Tahav Agerzua, restated his call for the declaration of Miyetti Allah Kautal Hore as a terrorist organisation, while also asking for the arrest and prosecution of their leaders for terrorism. The governor was reacting to the call by the National President of the Miyetti Allah Kautal Hore, Abdullahi Bello Bodejo, where he called for a declaration of state of emergency in Benue and Taraba states on account of crises between farmers and herdsmen. The governor said, “Incidentally, what Benue and Taraba states have in common is the enactment and implementation of ranches laws which prohibit open grazing. 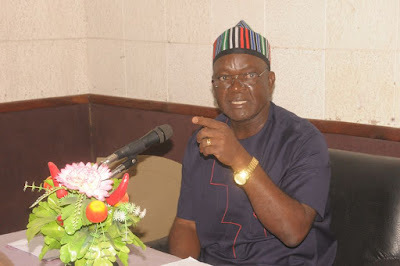 Ortom expressed concerns over the “failure of Police” to arrest the people, warning that “attributing the enactment of the law to non payment of workers’ salaries is untenable;” as several states with salary payment challenges have not resorted to the enactment of a similar law. The governor said already, his administrator had taken far reaching steps to regularise the payment of salaries with effect from January, 2018.